Interesting duo collection – and I am a sucker for this kind of performance. I was a big admirer of Lowen and Navarro, the Everly Brothers — circa 1968, Vigrass and Osbourne, Richard and Linda Thompson, Clive Gregson and Christine Collister, Richard and Mimi Farina, Nino Tempo and April Stevens and many less famous duos I have reviewed in the past that were marvelous. But this duo has a special relationship the other singers don’t. 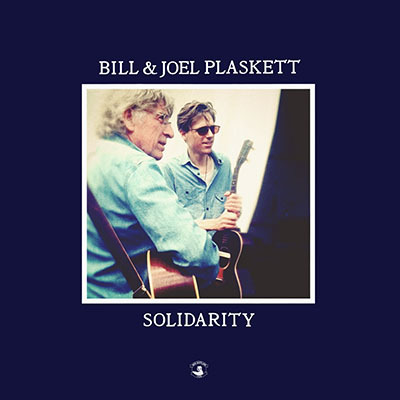 So, here I have this Bill and Joel Plaskett collection – Solidarity — and it didn’t take long for my ears to get pulled in. First of all, the production values are exemplary. Do I agree with their political lyrics or views 100%? No. But this is folk music. I don’t care about politics when I am focused on the music – I am not a big fan of Woody Guthrie but I do like “This Land Is Your Land,” because I understand where the man was coming from. The songs on this collection as a whole are what I am interested in. The presentation, the showcase, the spirit in which it was made – sincere. The song has an interesting back story about having to hire a medium to rid a studio of an unhappy spirit. That alone would interest me in a song. Seems the tune is sung from the perspective of the spirit. Clever. During the period of ridding a building of this manifestation, they found a dead dragonfly in the lobby. They keep this corpse now in a cassette box — a sign that the spirit has been eliminated? The tune was written by Joel with the tradition of Bill — his father’s guitar hero – Bert Jansch and Al Tuck. Yes…songwriters who were incredible in their own way. The song plods along pleasantly as ballads will go – but, then suddenly at 2:33 there is a spike and Joel whips out an electric lead guitar that fires off bouncing from Ronnie MacEachern’s fiddle and Erin Costelo’s accordion. All done with class including Bill’s fragile vocal approach which added to the poignancy. The song is pensive but it has a melody line that is vibrant and memorable. Hoping interest in the rest of the album hasn’t been compromised “The Next Blue Sky,” explodes with the drama and brilliance of Lowen & Navarro (“Cry”) and it sparkles. The voices are ambitious and create a nice exhilarating performance. Joel’s mandola rings out over the acoustic guitars and it’s just…it’s exciting. Yes, that’s what it is, exciting. Due to the passing of Eric Lowen in 2012, Lowen & Navarro are no more. But it’s nice to hear another duo carrying on in their tradition, or at least mining the same vein of music and doing it so well. The Plaskett’s have won multiple JUNO Awards in Canada and the father and son team are quite special as they manage to perform with such beautiful flexibility in a seamless jubilant showcase. These are not greenhorns but seasoned pros. Sounding old in a traditional manner is “Blank Cheque,” (the album version) and it has a nice solid beat with early strains of folk music. Lots of gas in their respective tanks – clean and clever drums accentuate with muscle as Shannon Quinn saws the fiddle in this tune. Joel himself lays down the beat on the skins.